You can transfer your repository to any user account that accepts your repository transfer. When a repository is transferred between two user accounts, the original repository owner and collaborators are automatically added as collaborators to the new repository. When a repository is transferred between two user accounts, issue assignments are left intact. Users must have repository creation permissions within the receiving organization before they can transfer a repository that they individually own. If Allow members to create repositories for this organization has been disabled in the receiving organization, only organization owners can transfer repositories into the organization. Your organization's default membership privileges will apply to the transferred repository. For example, if your default repository permission settings allow organization members read/write access, then all organization members can clone, pull, and push all repositories, including transferred repositories. See "Permission Levels for an Organization" for more information. If you transfer a repository from a user account to an organization, issues assigned to members in the organization remain intact. All other issue assignees are cleared. Only owners in the organization are allowed to create new issue assignments. 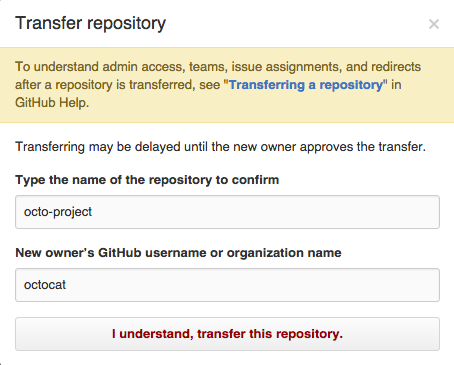 "Transferring a repository owned by your organization"